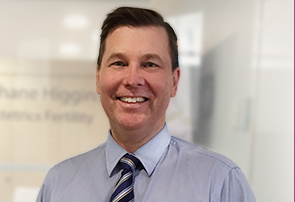 Dr Shane Higgins is one of Brisbane’s most experienced Obstetricians. Since commencing Obstetrics in 1989, he has delivered over 5000 babies here in Queensland. Shane joined QFG over 15 years ago, integrating fertility treatment into his practice after specialising in reproductive endocrinology while undertaking a fellowship at QFG. He is a fertility specialist with a family-orientated practice, and is popular with patients looking for continuity of care from a calm, positive doctor. Shane can offer the complete services of caring for you from initial fertility investigations right through to pregnancy and delivery at the Mater Mothers' Hospital.